Embrace your time with the Lord, no matter how busy you are! 10 Minutes in the Word: Psalms offers encouraging insights and meaningful reflections in just 10 minutes. For the days when you most need the presence of God, 10 Minutes in the Word: Psalms is the perfect way to grow in your faith that fits into your busy schedule. This devotional invites you into the Psalms, a place of praise and reflection. Realign your heart with God’s as you read through the Scripture and spend just a few minutes with Him. Whether you’re on a quick lunch break, between classes, or relishing some peace and quiet during nap time, 10 Minutes in the Word: Psalms gives you what you need to keep going. 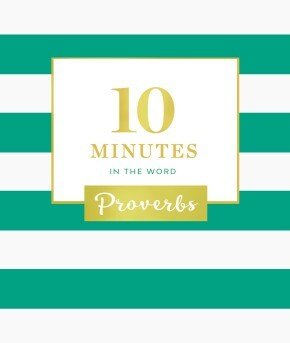 Just 10 minutes a day will guide you into Psalms, helping you feel closer to God and His Word. With a beautifully designed interior, 10 Minutes in the Word: Psalms is small enough to easily slip into a backpack, handbag, or diaper bag. Keep it on hand for whenever you have a spare moment to connect with the Lord.